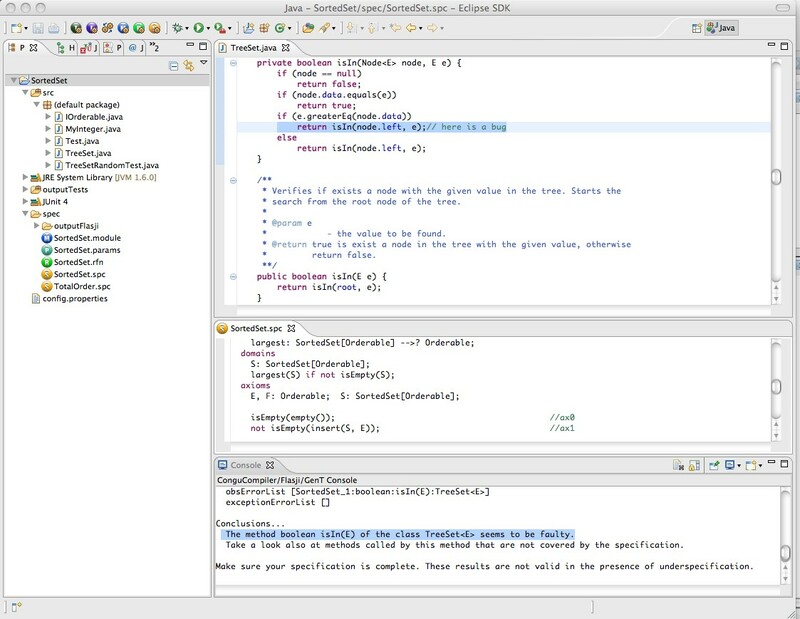 The general aim of QUEST suite of tools is to ensure the compliance of Java implementations of abstract data types (ADT) with their specifications. Specifications are property-driven, can be parameterized (by other specifications), and support the specification of ADTs independently of the programming language and programming paradigm. Flasji, a tool that automatically locates methods that are responsible for detected faults. 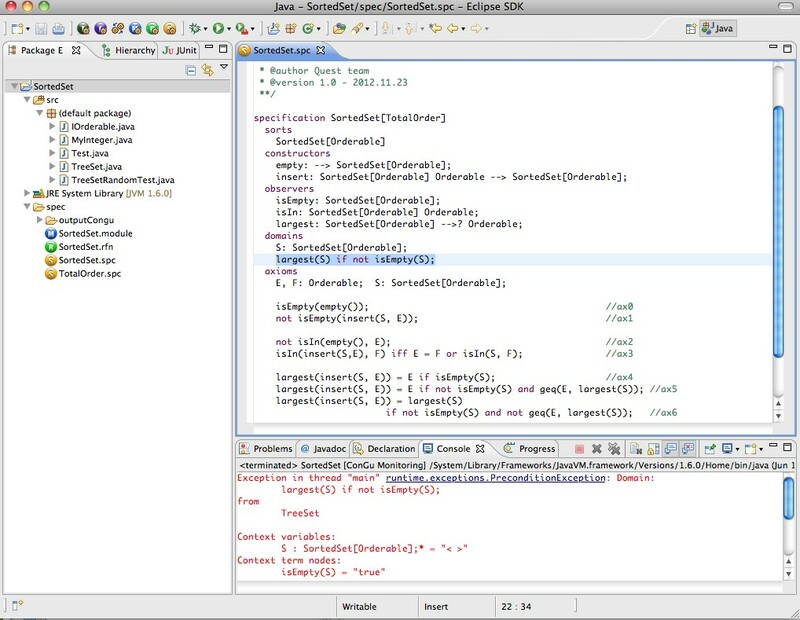 QUEST Eclipse plug-in supports the writing of ADT specifications, the run-time verification of implementations against specifications, the automatic localisation of faults and the generation of test suites. Copy the update site link http://www.di.fc.ul.pt/~mal/QUEST/updateSite to the work with field and press Enter. Select QUEST and unselect the “Contact all update sites during install to find the required software” option (the last in the screen). Press the Next button and follow the installation instructions. Also, trust us and accept the unsigned plugin. Locate the Eclipse directory on a directory path with no spaces. 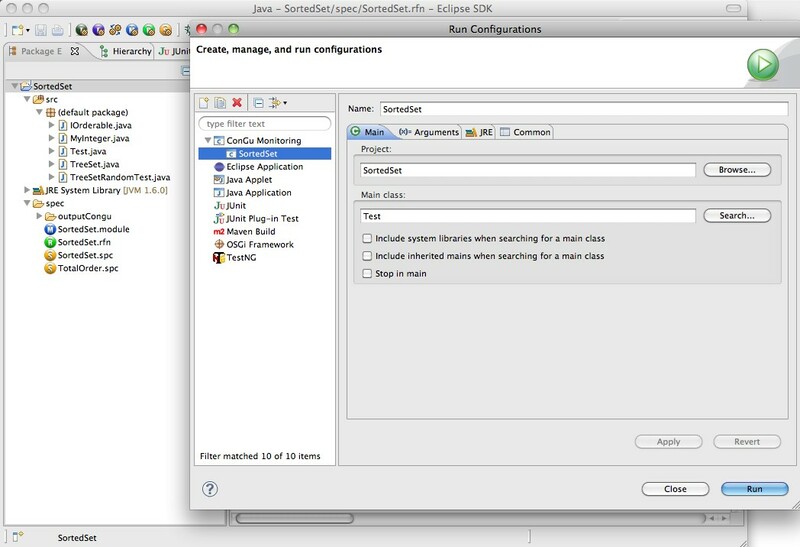 The plug-in does not work with more recent versions of Eclipse (eg., Luna or Mars). The plug-in makes use of the console javac command, so make sure you have it available (use the command java -version to get the version). The build path of your ConGu projects should include the JRE for that same version of Java. 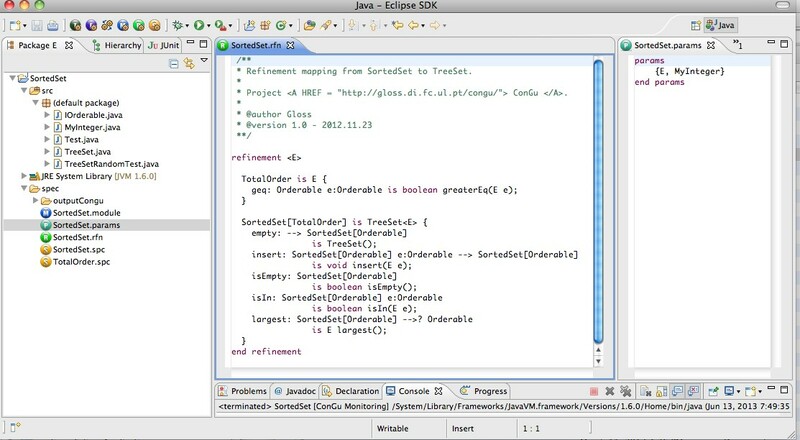 Eclipse should be running with the same version of Java. 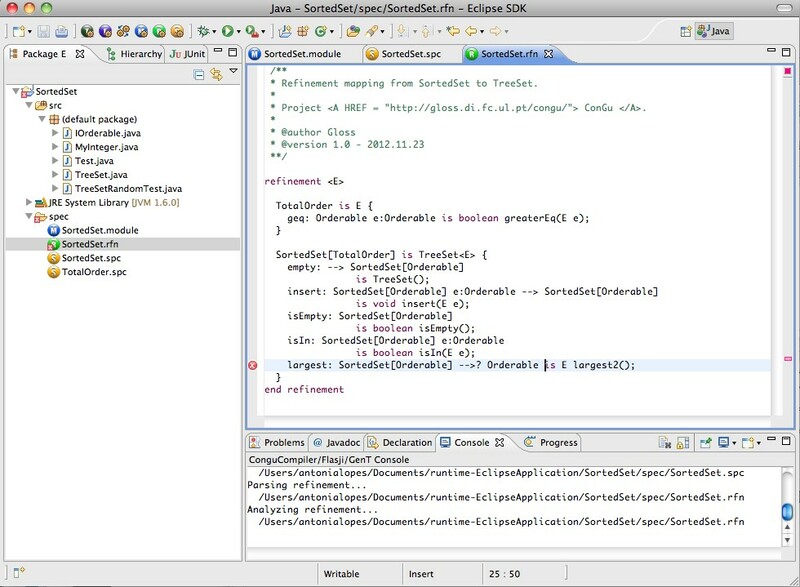 Hence, users with Mac OS running Java 7 or later, if asked to install Java 6 to run Eclipse Juno or Kepler, should start Eclipse application with the command line. ConGu is a tool that determines at run-time whether the classes that are subject to analysis behave as required by the specification. 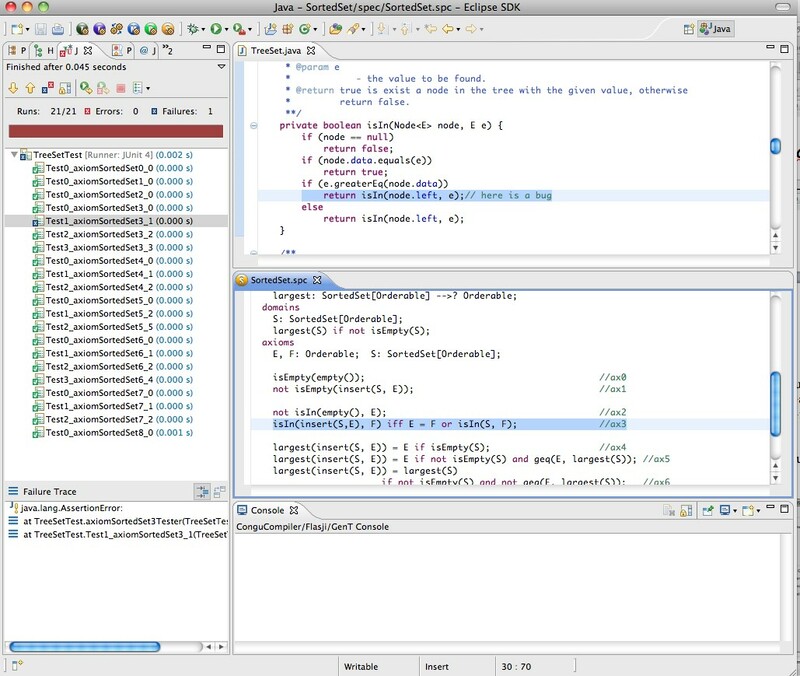 The tool performs the instrumentation of the bytecode of the classes under test, in order to intercept and forward certain method calls to automatically generated classes. Runtime checking of the specified properties at specific execution points is achieved directly by the generated code, relying on Java assertions. During the execution of a system involving the classes under test, objects are checked against the specifications and the violations are reported. The correctness of clients’ behaviour is also monitored whenever they use operations of the classes under test. In the case of generic classes with type constraints, it is also checked whether classes used to instantiate the parameters of generic classes conform to parameter specifications. In addition to Java source code (in folder src), you need to provide the specifications and a refinement from these specifications to the Java classes (in folder spec). The screenshots presented in this page are based on the SortedSet ConGu project available in the examples section. The project includes a specification of a sorted set and an implementation of this ADT defined in terms of a tree. The presence of syntactical errors in the specifications or in the refinement is signaled in the respective files (see an example below). The result of the compilation process is placed in the folder outputCongu. A violation of an axiom is reported in the form of a PostconditionException (see example below). The invocation of a method that refines an operation in a situation in which th>e domain condition does not hold is reported in the form of a PreconditionException (see example below). ConGu may also check whether classes used to instantiate the parameters of generic classes conform to what was specified in the parameter specifications. This requires to define a params file, explicitly indicating the classes that should be considered for each parameter (see example below). GenT is a tool that automatically generates JUnit tests that check the conformance of a set of Java classes with respect to the specifications. The generated unit test cases for Java generic classes, in addition to the usual testing data, encompass implementation for the type parameters. The proposed technique relies on the generation of several test goals for each axiom and the use of Alloy Analyzer to find model instances for each test goal. 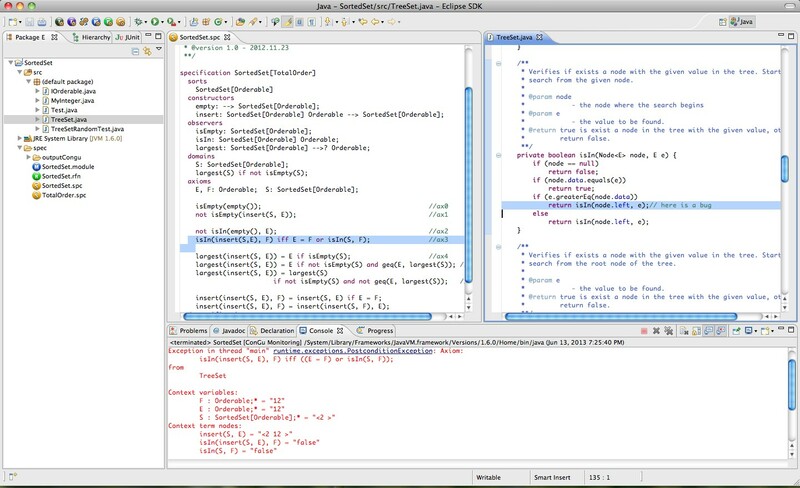 JUnit test cases and Java implementations of the parameters are extracted from these model instances. 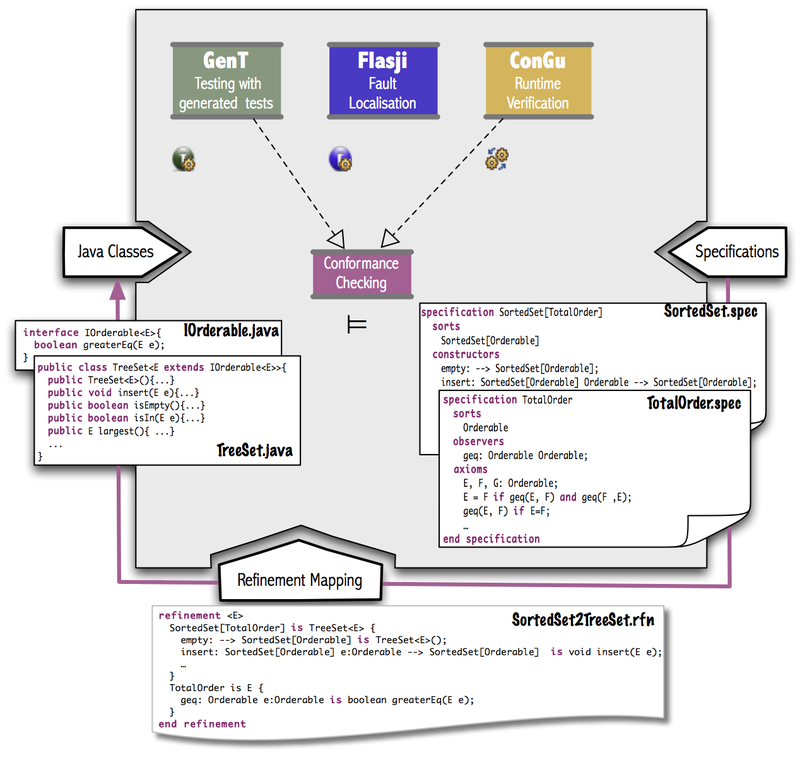 In order to use GenT you also need to start creating a ConGu project with the Java source code (in folder src) and the specifications and a refinement between these specifications and the Java classes (in folder spec). Proceed as described before. It is possible to define the number of elements of each sort that should be considered in the search for model instances. This search may take a while, depending, among other things, on the number of axioms. Progress is reported on the ConGu console in the form of the Alloy run commands that are being executed. 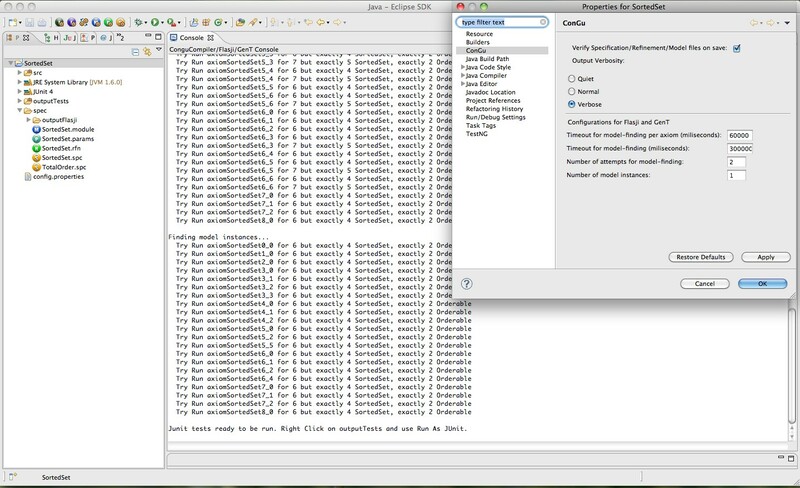 Through the properties of the ConGu project it is possible to configure some parameters that affect this search. Flasji is a fault-location tool that points to methods whose behaviour is incorrect w.r.t. the specification. It compares actual to expected behaviour, that is, it compares the behaviour of “concrete” instances of the Java classes under test with the one they should have according to the specification. Flasji picks all behaviour deviations and interprets them, electing one or more methods as the one(s) that are most probably ill-implemented. Since expected behaviour is given by the specifications, the method(s) Flasji points as guilty are among the ones that explicitly implement the specification operations as defined by the refinement mapping. If ConGu or GenT found that the classes that are subject to analysis do not behave as required by the specifications, we can use Flasji to try to locate a method that contributes to the detected fault. The conclusions are reported in the ConGu console (see example below). As with GenT above, the proposed technique relies on the use of the Alloy Analyzer to find model instances for the specification module. The concrete objects that are inspected for their behaviour are created according to these model instances. As before, it is possible to define both the number of elements that should be considered in the search for model instances and other parameters that affect the search. Below you can find some examples, ready to be used in QUEST Plug-in. 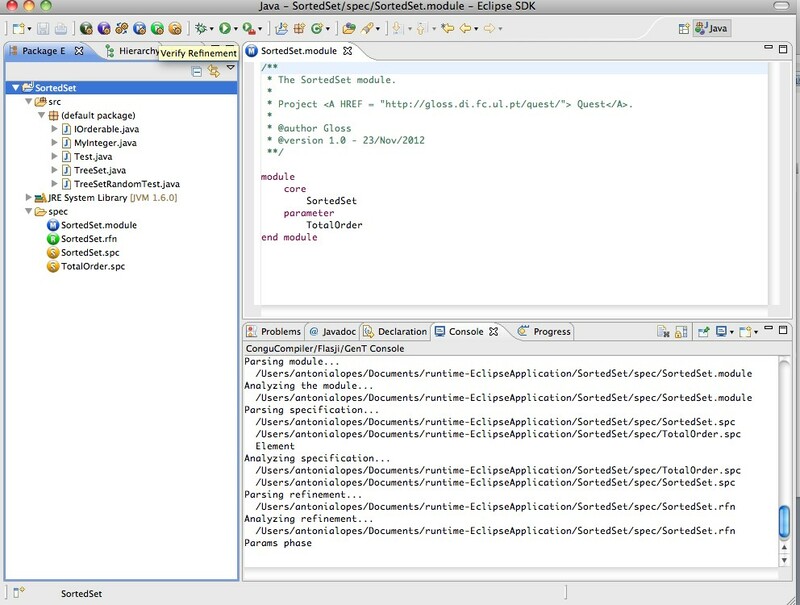 Each example includes a specification module describing an ADT (one or more specification files and possibly a module file), a Java implementation of the ADT (and possibly some classes used for instantiating the parameters) and a refinement mapping.